Welsh No.2 Peter Creed overcame European Junior Champion Patrick Rooney to triumph in the final of the LOC Charing Cross Classic, PSA M5 tournament held in London - lifting his sixth PSA World Tour title. The World No.75, known on the Tour for his entertaining, all-action displays, progressed to the final courtesy of wins over Portuguese qualifier Claudio Pinto and English duo Lyell Fuller and Joe Green. 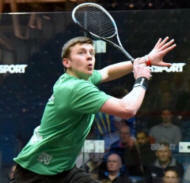 19-year-old Rooney, who was unseeded for the tournament, downed a trio of seeds on his way through to the final, putting third seed Chris Fuller, number eight seed Robert Downer and top seed Nathan Lake to the sword, with the latter of those fixtures going all the way to five games. Rooney, the World No.133, kept up his impressive form to go a game ahead in the final, only to take just a single point in game two after a superb response from Caerphilly-born Creed. The final two games were more closely-contested affairs, but it was the Welshman who came out on top again in both and he closed out a 5-11, 11-1, 11-5, 11-6 victory to lift his first Tour crown in 16 months. Teenage duo Patrick Rooney (right) and Kyle Finch moved through to the quarter-final stage of the 2016 LOC Charing Cross Classic after overcoming the Fuller brothers, Chris and Mark, respectively, in their first round fixtures at the Charing Cross Sports Club in London. Rooney, the reigning European Junior Champion, is appearing at his first PSA World Tour tournament in two months and enjoyed a strong summer after capturing his first Tour crown at the Madeira International back in June. The 19-year-old wasted no time in establishing himself on his fixture against Chris and surged to an 11-8, 11-6, 11-4 victory to set up a last eight meeting with fellow Englishman Robert Downer, who defeated Michael Harris in straight games. Elsewhere, Finch, a 17-year-old qualifier, will aim to reach the semi-finals of a PSA World Tour event for the first time since his maiden tournament back in August of last year after a comfortable 3-0 win over Mark earned him a place in the next round, where he will take on top seed Nathan Lake in what looks set to be a fascinating battle between the two Englishmen. Number two seed Peter Creed is the only non-Englishman to secure a place in the quarter-finals after the Welsh No.2 dispatched Portugal’s Claudio Pinto to set up a next round fixture with Lyell Fuller. Meanwhile, tournament wildcard James Peach caused the day’s biggest upset after bridging a 146-place World Rankings gap to shock New Zealand’s Lance Beddoes and his reward is a meeting with fifth seed Joe Green for a place in the semi-finals of the PSA M5 tournament.